This oratory appears briefly in documents from 1430 to 1460 as the seat of a confraternity that administered a hospital. It now belongs to San Lorenzo, and was restored in 1979 to reveal many of its original features. The façade is built from pink and white stone. 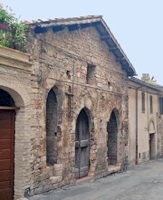 The two closed windows that flank the central portal were probably originally "porte del morto" (doors for the dead). (For the other oratories in Spello, see the page Oratories and Hospices in Spello). 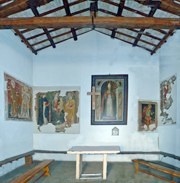 Although the interior is small, it contains a number of interesting frescoes. This altarpiece is on the back wall, behind the high altar. Once again, St Blaise holds the wool comb with which his flesh was torn to shreds during his martyrdom. ✴the Madonna and Child with SS Peter Martyr and Blaise (Biagio), to the left on the back wall. St Blaise holds the wool comb with which his flesh was torn to shreds during his martyrdom. This very damaged fresco is on the left wall. ✴an angel making peace between two nobles. This fresco is to the right on the back wall. This very damaged fresco by a follower of Bartolomeo di Tommaso is on the right wall.